Pubmaster is one of the UK’s leading and most progressive pub retailers. As a specialist business focused on operating and developing quality tenanted pubs, Pubmaster currently operates around 3000 pubs nationally, in conjunction with its licensees. With no brewing ties, the company is free to respond quickly to market demands and uses the latest retail market research techniques to meet consumer and licensee needs. It is this commitment to understanding its market, combined with its focus on tenanted pubs, that differentiates it and has led to its superior market performance. Pubmaster operates three year rolling tenancy agreements and develops close relationships with its tenants, primarily through its Business Development Managers. The BDMs, who each look after about 50 pubs, report in to Senior Operations Managers, and together they are responsible for the profitability of their pubs and for all operational matters pertaining to the tenancy eg hiring new tenants, rent reviews, investments in the buildings etc. In early 2002, Pubmaster acquired the organisation ‘Inn Partnership’ and as a result of this merger, there was a subsequent need to integrate the operational procedures of the two companies. One of the main procedures involved is called the ‘Change of Tenancy’ (COT) process, when the existing tenant moves out and a new tenant is then sought to run the pub. In order to accomplish this change, seven or eight separate processes would be required (eg notice received/given, rent changes, notification to recruitment etc), each involving the completion of separate forms, with several different people involved in the approval chain. ‘The old operational procedures were paper driven, very time consuming and repetitive, as the same information had to be filled out on several different forms. Inevitably this would result in errors as well as regional variations in how the data was presented. As forms had to be sent back and forth from regional offices to head-office, some would go missing en route resulting in delays and ‘black holes’ in the system’. An operational working party was set up to review all the processes and forms used by both companies so that all procedures could be rationalised and standardised. The working party soon agreed that in order to increase efficiency and accountability it would be necessary to move the key operational processes ‘online’, to form an electronic data workflow system. At that point Jackie Hunter, Business Information Support Manager, and responsible for IT became involved and reviewed the available software options. Smart Media, a software consultancy specialising in Internet and intranet based applications, was already working with Pubmaster and had successfully implemented their company intranet and a property maintenance/helpdesk solution. Smart Media’s product ‘Intelligent WorkFlow’ is a 100% browser based business process management tool for intranet/extranet use. It compared very favourably with competitors’ products and was easy to integrate with the intranet and the pub’s SQL database. It was according to Jackie ‘the natural solution’. For the next phase of the project the operations staff catalogued all existing forms and documented all processes, as well as agreeing authority levels for the various procedures. As a result of their review 44 forms were reduced to 12 key workflows. The IT Department then created the process workflow charts, the whole process taking about six months from initial review to completed workflows. It was then time to rollout the system and train the BDMs. 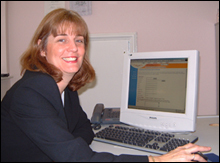 Pubmaster’s own inhouse IT trainer produced the training course which was run region by region, starting in June 2003. During the training a separate server was set up which replicated the workflow data processes so that the training could be carried out without any risk to the live system. This is also now being used for the Disaster Recovery backup service. ‘I liked the Intelligent WorkFlow product right from the start. It met the brief in terms of automating our processes and is very easy to use. Because it is linked to the pub database, you merely type in the pub account number and all the relevant information appears on the screen. It has very simple input screens and an intuitive screen layout. My staff have been very impressed with the package and have complete confidence in it’. As the system was rolled out there were a few minor operational issues that needed to be sorted out, eg some of the forms needed amending, but these were speedily resolved. From an IT perspective everything ran very smoothly and the system went live at the end of October 2003. Jackie Hunter is pleased with the implementation of the project and how the Intelligent WorkFlow product supports the complex business rules of her organisation. For the COT process for instance, five separate paper forms have become one workflow process. ‘It is quite a complex flowchart, involving parallel routing, but Intelligent WorkFlow supports it very well’, she remarked. For her the main benefit of the system lies in the fact that it provides a full audit trail. She comments: ‘It ensures that there is only one version of the form in the system, and that the form reaches its intended recipients. Knowing where the form is in the system and who is holding it up ensures accountability and is of huge benefit to the organisation. In future I would like to see the Intelligent WorkFlow product used for HR and property processes’. Chris Welham sees numerous benefits from an operations perspective. It saves his BDMs time by reducing the amount of repetitive administration they have to perform and by reducing errors. The system is streamlined, producing an online central database of information that is accessible by anyone at any time. It empowers his BDMs by allowing them to do their administration at home and freeing up their time so they can be out in the field, driving the business forward. Both Jackie and Chris were very impressed with Smart Media and the people they worked with at the organisation. ‘The people at Smart Media were professional, knowledgeable and personable. They were very quick at picking up and understanding our business. They listened to our suggestions about the product and implemented the changes which they felt were valid. I wouldn’t hesitate to recommend them’ said Jackie. 'The people at Smart Media know their stuff from an IT perspective and are able to speak our language when it comes to understanding the business. They were a joy to work with and delivered what we wanted. I am delighted with the whole project’ said Chris.